This morning, I’m really flummoxed that I don’t have that telescope Santa keeps promising me for Christmas. I was out ogling the early morning sky, and it was possible to see comet Siding Spring near Mars then, hours before its closest fly-by (2:27 PM EDT, 11:27 PM PDT, 18:27 GMT). That’s day time in North America, and yet the real irony belongs to Australia, where the comet was originally discovered last year. The comet closest fly-by won’t even be in their sky at all. The Deep Space Network dishes in Europe, the US, and Puerto Rico can watch. 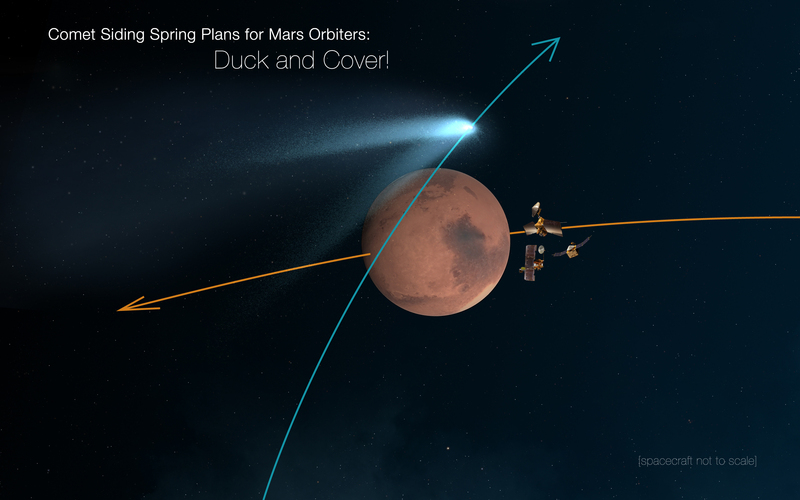 The comet will scrape by Mars at a distance of 82,000 miles. That’s a third of the distance between Earth and the Moon. Comet Siding Spring originates from the Oort Cloud, a cloud of comets that surrounds our sun at a distance almost quarter of the way to the nearest star, Proxima Centauri. There are spacecraft in orbit of the planet Mars from the US, the European Space Agency, and India. They will all be ducked behind the far side of the planet during closest comet approach. But as they swing back around, they might still get a bit of comet dust on them. This has the potential to be very, very bad. A tiny spec of comet junk flying at enormous speed could punch holes right through an orbiting tin can like Earthling’s Mars satellites. Hopefully, though, all they’ll catch are some cool photos.